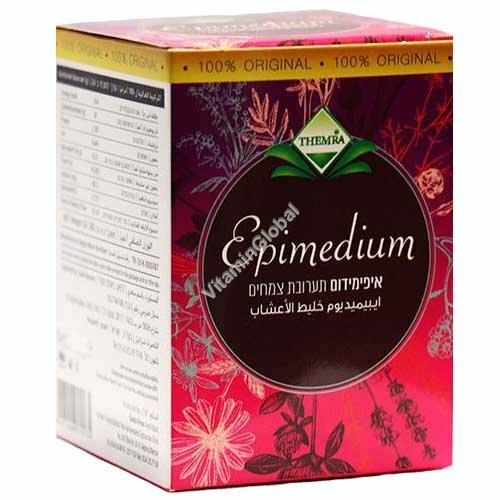 Themra’s Epimedium is a mix of 19 different plant extracts designed to be a libido enhancer which can provide both men and women improved sexual performance and sustained arousal. The most potent of the 19 plant extracts is the eponymous epimedium, a flowering plant well-known in traditional Chinese medicine for being a natural aphrodisiac. It is also popularly known as barrenwort, bishop's hat, fairy wings, and horny goat weed. From a scientific stand-point, the main chemical in epimedium, called icariin, inhibits the enzyme PDE-5 in much the same way as sildenafil and related prescription drugs, which would explain its efficacy as an aphrodisiac. Ingredients: honey, glucose syrup, strawberry molasses, pollen powder, epimedium (0.79%), carob, oats, ginger, galangal, cinnamon, maca root, American ginseng, biloba, red ginseng, pumpkin, tribulus, cola nut, vanilla, royal jelly. Directions: Mix well before use. Take up to one teaspoonful (5 grams), one hour before having relations. At least 8 doses per box, depending on amount needed for satisfactory results. Pregnant women, lactating women, and people taking any medications should first consult with their doctor. This is especially important for anyone taking protease inhibitors. The above information does not constitute medical advice. In case of any suspected negative reaction to the product, consult your physician immediately.